Spacious and comfortable padded seat that flips up to expose basket storage area 18 in. x 23 in. 8 in. 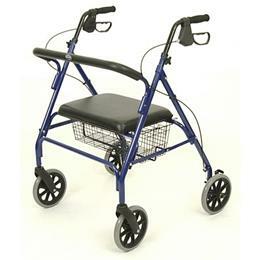 casters for improved mobility over rough indoor/outdoor terrain. Padded, removable backrest for back support while seated. Easy to operate hand brakes that can be locked out. Extra deep and wide frame. Overall Width: 31 1/8 in. Width Inside Hand Grips: 22.5 in. Width Inside Base Legs: 22.5 in.